Have you watched children draw houses or towns? What kind did you draw when you were a child? Did they look like this? 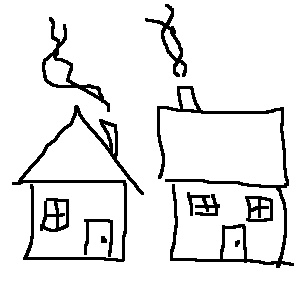 From what I’ve seen, children draw traditional buildings. They forget to leave room for the cars. They draw towns for people. 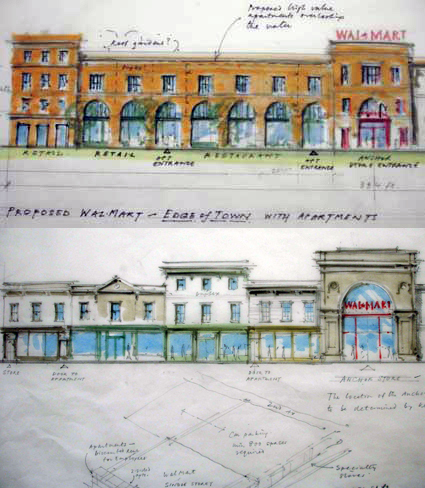 The people of the Gulf Coast, helped by some architects, have been drawing towns for people too. Did you know that a Wal*Mart could look like this? John Massengale, one of the architects who participated in the Mississippi charrette notes that Dover Kohl & Partners had been working on a plan for Bay St. Louis before Katrina. 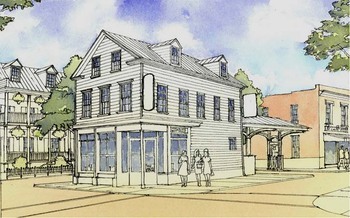 I particularly like their rendering of a gas station. See how the car port and pumps are behind the building, while the convenience store rests conveniently on the sidewalk? David Sucher, author of City Comforts and a Seattle developer, has three rules for an urban site plan. This gas station uses those three simple design patterns.